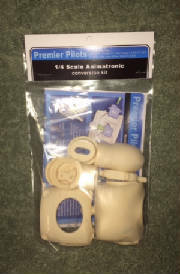 I have new animation kits now available. 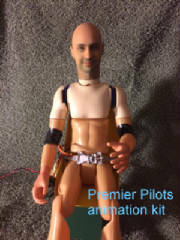 Now you can add the kit plus servos (not included) and animate your pilot. Or you can add a controller board and program your pilot to move independendly. NB Shoulder servos must be 9 gram metal gear! When programming, attach board, connect servos before mounting and name each channel in the software. Then in the channel settings tab set speed to 20 for head turn and arm movements and set speed to 30-35 for nodding and forearm movements. Acceleration is set to 60, but can be a bit lower. Hit Apply settings. All servos will be unticked. Mount servos in the pilot without cloths, I run servo leads thru the trousers after have set all servos as described below. Go to Status tab. Adjust 1 channel at a time. Move slider until slight servo binding, back a little and copy paste the value to Channel settings tab for both directions. Hit Apply settings and repeat for all channels. Test all channels and fine tune. Program by moving any number of sliders to desired position and Save frame. Save as many frames as desired. Go to Sequence tab and run your sequences. Adjust duration of each sequence by double clicking the sequence. 300-500 ms for small fast movements, nodding and short hand movements. Other movements should be set to 1000-2000 ms to give time to complete the full servo run. By control marking several frames you can copy paste to get nodding and waving. I set start frame to 3000 ms and copy past it as finishing frame also. Prevents undesired movements with binding and damaged servos. When ready save a settings file and copy all sequences to script, click run at startup and you have a working animation. I use the NERS - Nano Electronic Receiver Switch V2 to power the board, thus all servos are unpowered when the RX channel is inactive. Saving servos again! 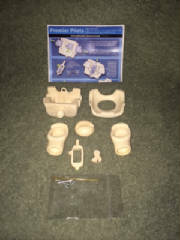 Contact Premier Pilots to set up order info@premierpilots.net and any questions.